I was trying to install Linux on my MacBook for class when I bricked my computer, which now in an unbootable state. I saw some similar threads, but my main bootable drive is the one that got corrupt. I don't want to lose any data. I'm not the most terminal savvy, so ANY help is appreciated, and I will kindly provide any additional information! Below are the results of $ diskutil list and $ gpt -r show disk0. I just wanted thank @klanomath for helping me through this entire process. He spent 11 hours TeamViewing with me until not only my files were accessible, but until I could access my computer as could before this whole debacle (and this was after 5 hours of email correspondence). To any future reader with this problem: PLEASE don't give up, it can be fixed! To add an answer exactly fitting to your case I slightly modified my answer in the linked "duplicate" and posted it here again. The second as well as the third partition of your internal disk got the wrong partition type, your data probably won't be lost. A bootable OS X partition (except the Recovery HD) either has the GUID 48465300-0000-11AA-AA11-00306543ECAC for a standard OS X partition or the GUID 53746F72-6167-11AA-AA11-00306543ECAC for a CoreStorage partition. The FFFFFFFF-FFFF-FFFF-FFFF-FFFFFFFFFFFF is an unknown partition type (but not no partition like the 000000-0000-0000.... one). The first block of a standard OS X partition doesn't contain non-zeros, the first block of a CoreStorage partition contains some non-zeros. To get the first 3 blocks of a partition you have to use a substitute for hexdump/xxd (both aren't available in Recovery Mode/OS X Installer boot drive). The best I have found is dd if=/dev/diskXsY count=3 | vis -c.
The GUID partition table can be modified with gpt. 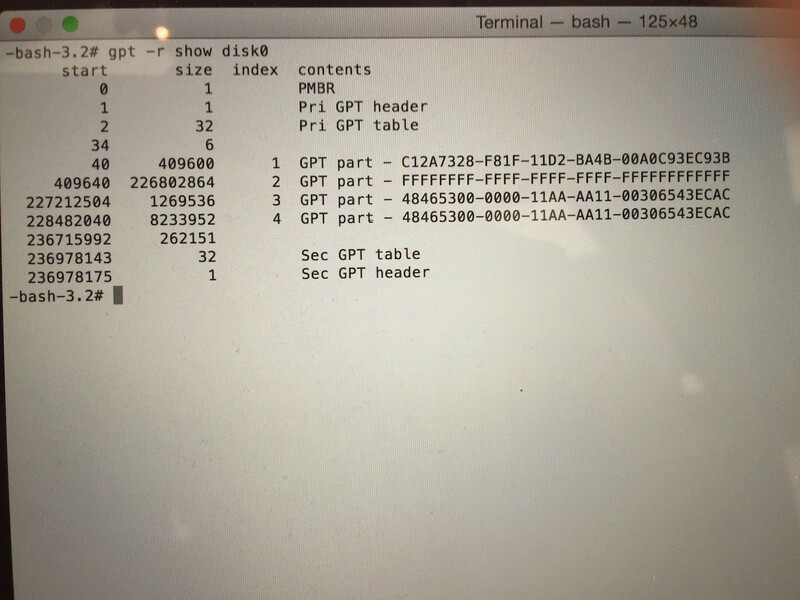 gpt only writes to the first 34 and the last 33 blocks of a disk(512) or the first 6 and and last 5 blocks of a 4k disk. Modifying the partition table (even falsely) doesn't alter the content of any volume on your disk, if you don't initialize or repair a volume/disk by request. You may verify it though. If you get an error message like "resource busy" just unmount the disk again or unmount stubborn volumes with diskutil umount disk0sX. Finally verify/repair the disk with diskutil verifyDisk disk0 and/or diskutil verifyVolume disk0s2. If a repair is needed use repair (instead of verify) as prefix in the above commands but contact me before repairing it and send me the error message. After installing a full macOS to a thumb drive and booting to it, the EFI partition and the Recovery HD of another non-FileVault drive (actually those of a Sierra VM) were dd'ed to the broken drive. Still booted from the thumb drive, the FileVault volume was reverted to a standard volume by right-clicking on the volume in the Finder, choosing "Decrypt volume" and entering a valid user password. This has to be the password of an eligible user account on the FileVault volume. Other methods to decrypt the volume like diskutil cs revert lvUUID or diskutil cs decryptVolume lvUUID - tested in a virtual machine only - didn't seem to work. This might be a restriction of VMs though. 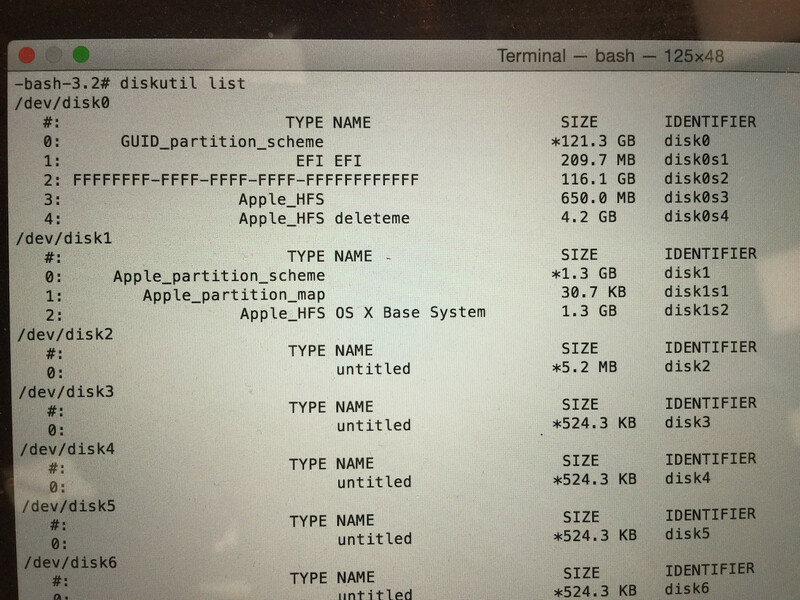 To expand the main partition (disk0s2) to the full size, use Disk Utility or the diskutil resizeVolume ... command. The volume initially didn't appear in System Preferences > Startup Disk, but alt-booting the Mac unveiled the main volume. This probably re-blessed the volume's boot.efi properly. The (now standard) volume appears in Startup Disk again. Then last check with diskutil verifyDisk disk0 and diskutil verifyVolume disk0s2 without warning or errors. Reboot successful. Not the answer you're looking for? Browse other questions tagged macos partition unix filevault dual-boot .